1. The former county of Caernarvonshire formed part of which new county in 1974? 2. The Welsh comedian and singer Harry Secombe played which central character in the Goon Show. 3. 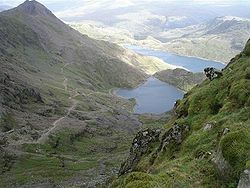 Which traditional Welsh gathering lasting up to a week is dedicated to the encouragement of music, poetry, and literature? 4. On their shirts, the English Rugby Union team's emblem is a red rose, the Scots is a thistle. What is the Welsh emblem? 5. Which Welsh designer founded a highly successful international chain of shops selling a Neo-Victorian country style in clothes and furnishings? 6. What has buck rarebit got that Welsh rarebit hasn't? 7. Which defensive earthwork along the Welsh border was built in the 8th century AD? 8. Which Dylan Thomas book describes a day in the life of a small Welsh fishing village? 9. At which racecourse is the Welsh Grand National run? 10. Which Welsh word is used as a term of endearment, usually after a person's name, and is also the name of a German composer? 11. 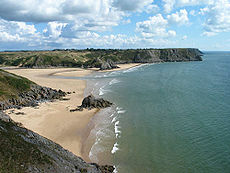 Which Welsh town was the setting for the TV series, "The Prisoner"
13. What is the name of the 182 mile long earthwork which once marked the boundary between England and Wales? 14. What was the name of the Welsh mining village where a slag heap collapsed onto a school in 1966, killing 81 children? 15. What is the name of the Welsh city which is the smallest on Britain? 16. Which two Welshmen have competed for the title of World Snooker Champion? 17. Which Welsh group had hits with the songs "The Bartender and the Thief" and "I wouldn't believe your radio"? 18. What is the name of the river that flows through Cardiff? 19. Who is the teenage Welsh soprano with, according to her album, "The Voice of an Angel"? 20. Who drove Ivor the Engine?